I am not a sheisty salesperson, a thief or someone who goes around beating people up, but my nails were definitely capable of all three. Still coming off the holiday season high, I settled on a rich blue with high shine and a creamy finish. 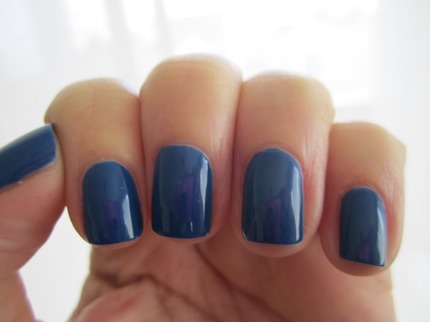 Butter London's Blagger is not for the faint of heart; it's eye-catching, conversation worthy and scene stealing. With just a wave of the hand, I could've probably stopped traffic - the intensity of the colour is so striking it allowed me to live vicariously through my nails last week. The combination of Essie's Protein base coat, followed by two coats of Blagger and then finished with Seche Vite allowed for optimal wear time. The finish remained shiny and I didn't notice the usual chipping near the edge of my right index and middle fingers. I defintely think I could've stretched out my weekly manicure far beyond this past Saturday. *Special note to Karen (if you're reading this): Mom says you've been keeping up with me here - just wanted to say hello and thanks for reading!